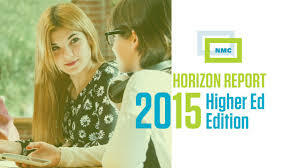 We might mistakenly think we’re moving into a place where technology becomes more important than people and engagement in the training-teaching-learning process as we look at the farthest reaches of the recently-released New Media Consortium (NMC) Horizon Report > 2015 Higher Education Edition on key trends, significant challenges, and developments in educational technology. This, after all, is where we find concise descriptions of adaptive learning technologies (learning opportunities programmed to respond and adapt in an apparently personal way to an individual learner’s progress, performance, and unmet learning needs) and the Internet of Things (automated tracking and control of objects within our world) discussed within a four- to five-year time-to-adoption horizon. We would even be well-justified in approaching these developments—particularly adaptive learning technology as part of a larger movement toward new levels of personalized learning—with a great deal of skepticism. We have, after all, seen well-intentioned colleagues in instructional design create asynchronous online learning modules that appear to offer learners different learning paths with personalized responses based on learners’ choices, only to discover in the worst of cases that the “different” paths all lead to one generic screen of feedback that is so broad as to be meaningless—particularly if a curious learner works his or her way back through a lesson and sees that the various allegedly personalized and divergent pathways all lead to the same meaningless one-screen-serves-all response. But this is not the world of adaptive learning technologies described within the Horizon Report. Here we really are seeing a well-documented “emergence of adaptive learning technologies” reflecting “a movement in academia [and in other learning environments] towards customizing learning experiences for each individual” in meaningful ways (p. 44): if a learner is clearly mastering a topic, the adaptive programming advances the learner to an appropriately more-challenging set of problems or to the next topic to be studied, while a struggling learner is moved to different content that offers additional supportive learning opportunities to plug that person’s learning gaps. The winning element in the best of these examples is that learning facilitators are encouraged to remain integrally involved in the design and use of this technology to the benefit of the learners they serve; those trainer-teacher-learners understand that adaptive learning “is best suited to take place in hybrid and online learning environments” (p. 44), Report co-authors Samantha Adams Becker, Alex Freeman, and Victoria Estrada note. Following resources cited within the NMC Horizon Project 2015 Higher Education Edition, we find descriptions of a “flurry of activity and experimentation around adaptive learning,” “the relatively recent emergence of sophisticated adaptive learning software and platforms,” and plenty of collaboration and partnerships between key players in training-teaching-learning (John K. Waters, “The Great Adaptive Learning Experiment,” Campus Technologies). If we follow that article to first-rate adaptive-learning technology reports prepared and posted online by Tyton Partners (formerly Education Growth Advisors), we are rewarded with two additional reports well worth reading to quickly immerse ourselves in the state of adaptive learning: the overview “Learning to Adapt: A Case for Accelerating Adaptive Learning in Higher Education” and “Learning to Adapt: Understanding the Adaptive Learning Supplier Landscape,” a survey of several vendors engaged in producing and supporting adaptive learning technology. The authors of the Tyton Partners “Case for Accelerating Adaptive Learning” conclude their white paper with comments providing a fair assessment of where we remain for the moment: “…adaptive learning applications…still remain long on promise, and we must start where we are. But we are already somewhere quite interesting…fostering more personalized collaboration among students and with instructors by virtue of new tools and new data that promise to bring the power of learning to more learners more effectively and more efficiently than ever before” (p. 16). If trainer-teacher-learners collaborate to drive the process in ways that focus on learners rather than putting the tech tools at the center of the learning process, this remains a world well worth exploring, as we see in a brief video produced by Knewton, an accelerated-learning vendor. When we turn our attention to the “no longer far-fetched” world of the Internet of Things/The Internet of Everything, we find ourselves in “a world where all people, objects, and devices are connected to act in concert, regardless of brand or vendor” (Horizon Report, p. 46). Our New Media Consortium guides, in this instance, write about how this technology provides the potential for learners to “carry connected devices with them” so they can “benefit from a host of interdisciplinary information that is pushed to them from their surroundings” and to “create an environment where learners are informed by crowdsourced contributions and observations from the community via networked objects” (p. 47). Examples of the Internet of Things in action within learning settings include those fostered by the University of Wisconsin-Madison Internet of Things Lab, which features hands-on experimentation by learners, and efforts by University of Pennsylvania students to engage in product development. If we engage in the spirit of the Horizon Project reports, we don’t stop here; we continue exploring the numerous resources available to us to learn more about the Internet of Everything and its potential to combine people, process, data, and things in ways that further support learning innovations, as described in Cisco’s brief “Education and The Internet of Everything” video. This ultimately reminds us that reading Horizon Project reports is the beginning, not the end, of an important process in our own lifelong-learning efforts; what matters most is what we do with the information and inspiration these reports consistently provide on educational technology, its key trends, and the challenges we face in the dynamic world of training-teaching-learning. NB: This is a final set of reflections in a six-part series of articles exploring the latest Horizon Report. This entry was posted on Thursday, February 26th, 2015 at 1:42 pm and is filed under technology, training. You can follow any responses to this entry through the RSS 2.0 feed. You can leave a response, or trackback from your own site.